Will digital books will ever match printed ones for sheer reading pleasure? What about comic books and graphic novels? I think it depends on what device you are reading them. One of the most visually stunning apps on the iPad, for instance, is the Marvel Comics reader. You just swipe from page to page, and when you tap on a frame it becomes larger and moves forward. The swiping gives the comics a sense of motion you don’t get on paper. A startup called Graphic.ly is taking a similar approach and adding social elements. 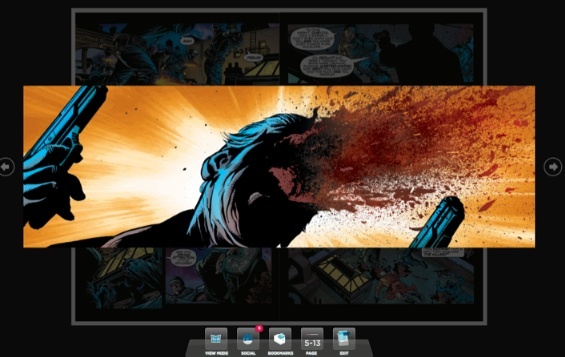 It recently came out of beta with an AIR app for desktops which includes a digital comic reader, store, and social activity feed. Apps for the iPad, iPhone, Android, and Windows 7 are coming soon. And eventually it will exists as native Web app as well. The AIR app gives you a taste of what is to come. CEO Micah Baldwin gave me a demo last week at the 140 Conference in New York City (see video below). The app starts with an activity feed showing all the comics your friends are reading and their comments. This serves as a discovery mechanism. When you load a comic book—there are about 70 right now and growing from independent comic book publishers, but Baldwin hopes to add Marvel soon—you can click on each panel to make it pop forward and become bigger. You can also add comments and attach them as little circles to any part of the an image (these comments can be turned off if you don’t want to see them). And individual pages can be shared out to Facebook as an image file, with a comment. The AIR app is decent, but I really want to see this on an iPad. There is just something about comics that makes you want to hold them in your hand. Graphic.ly launched as a TechStars startup last summer when it was called Take Comics. Since then, it renamed itself Graphic.ly, raised $1.2 million, and added Baldwin as CEO.